Install Your own bidet on your existing toilet. No Plumber Needed. All installation materials included. LOCAL INSTALLATION SERVICE AVAILABLE FROM REACH MEDICAL, INC. CALL 901-861-6068. INSTALLATION ONLY AVAILABLE IN THE MEMPHIS AREA. Bidets are widely used across most countries around the world, but they are not commonly available in homes across the USA in spite of the advantages and benefits that a bidet offers over a toilet. Going to the bathroom is a subject that many consider taboo, and few discuss their bathroom habits or consider other options because of the sensitivity of this subject. At first you may find the idea of a bidet funny, anyone who has never used one does not realize just how great this bathroom appliance can be or what it offers. At first you may be hesitant to try something new, especially in the bathroom. Anyone who has used a bidet loves it, and those who have one can not imagine going back to the old toilet paper method of cleaning after using the bathroom. You should not be embarrassed to discuss your bathroom needs, we all go and everyone wants to be clean afterward. The benefits of a bidet are numerous and using one can change your bathroom habits permanently. We believe every American has a right to feel clean and fresh after using the bathroom, and we want to help increase the popularity of the bidet in American homes. The nozzle only drops below the guard gate when the bidet is used. When the water is turned off, the nozzle automatically retracts for hygienic storage. While the bidet is designed to keep the retractable nozzle clean, this model also has a cleaning feature to thoroughly rinse the nozzle. The unobtrusive control panel features a chrome-plated knob that allows the user to activate and adjust water pressure. 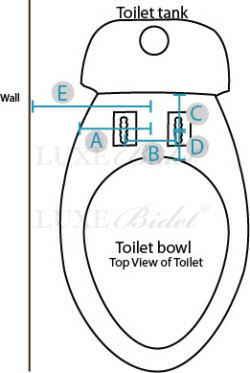 With clearly defined settings, the bidet can easily be operated by children and the elderly. A second knob switches from wash to nozzle cleaning. Neo bidets feature high-pressure valves with a metal or ceramic core. These are the same valves used in quality faucets and showerheads. Braided steel hoses are included to connect the bidet to the water source. These fittings match standard U.S. plumbing sizes. Neo bidets have passed the widely accepted ASME plumbing standards for manufacturing materials, durability and water pressure requirements. Neo bidets have passed sections dealing with durability (sections 3.4, 5.6, 5.7, 5.8), functionality (sections 2.6, 3.6, 4.1), material quality (4.9, 4.14, 5.1, 5.2 ), compatibility and design (4.2, 4.4, 6.0), and high pressure testing (section 3.2, 5.3, 5.5) of ASME A11218.1-2012/CSA and ASME A112.4.2-2009 as tested in IAPMO R&T lab. Distance from screw to toilet tank: minimum 1.0"
Click the button below to add the Luxe Bidet Neo 120 to your wish list.